With my less than awesome DIY skills it took several hours but we’re finally there. 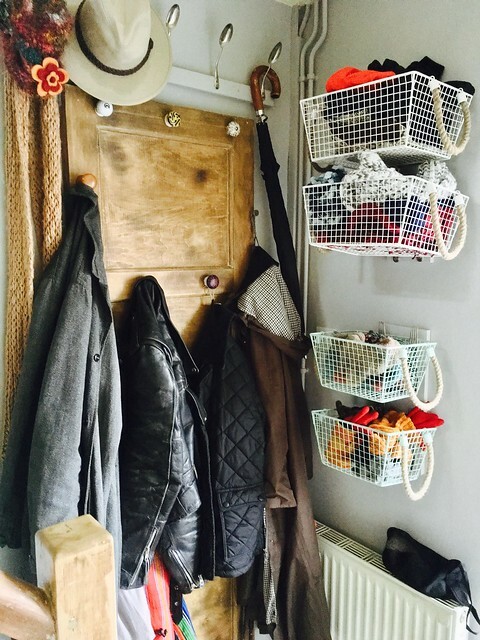 The door of coats has been in place for a while but I added a hat rack, made from old spoons, and hooks for the baskets (look closely and you will see old forks pressed into service). Upcycling is us. The cutlery was hammered with a rubber mallet, using scrap blocks of wood for shaping. The trickiest part was drilling the holes to screw them in. The most important factor was using sharp drill bits, which made the job much easier. I used a centre punch to make small dents, a 2mm bit to make a pilot holes and then a 4mm bit to widen them out. By the end (26 holes later) I was getting quite adept at the job. Practise counts as well but I’d still say that not skimping on the tools was vital; otherwise I might still have been out there, slowly increasing the dents I was making! This was another iPad photo, shot and edited on the device and I’ll count it for keeping on top of my 52photos project. It was shot using the “HDR” setting. Close up, it is quite pixellated (ISO noise?) but, given the high resolution of the camera, that isn’t too much of an issue.